The jazz duo affords its participants wonderful opportunities to stretch out creatively. Ideas, suggestions and negotiations of all musical kinds percolate back and forth. And, in the best of instances, they birth new nuggets for further development and exploration. At the same time, the duet framework can possibly limit, as competitive natures and stylistic dichotomies might overtake the mutual partnership and pose distraction. 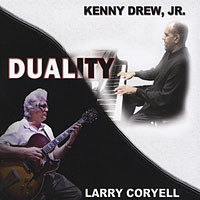 Duality, which features the marvelous talents of pianist Kenny Drew, Jr. and guitarist Larry Coryell, epitomizes the absolute best in piano-guitar duo playing. The improvisational banter, the interplay and feeding of ideas throughout this effort is pure listening joy. 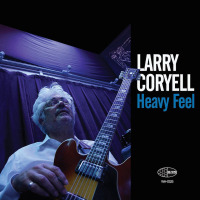 Drew and Coryell work so well together that interest never wanes, regardless of tempo, tune or musical genre. What emanates from the musical mind-melding of these the two superbly cooperative and inventive artists is jazz elegance, swing, and subtle, creative power. Horace Silver's "Silver's Serenade" sends the duo mission off on a neat mid-tempo foray. 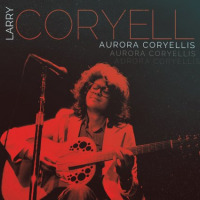 Whether guitar takes the melody, as Coryell's mellow playing does on this cut, or Drew's keyboard elsewhere, the result is a richness, a fullness easily giving an illusion of a larger musical unit. Both these fine players understand and brilliantly display the subtleties of accompanying a soloist. "Farmer's Waltz" lilts lightly, with Drew and Coryell stretching out and never straining. Drew's touch, as his ability to stretch an improvisational idea, is all taste, with technique never dominating musicality. 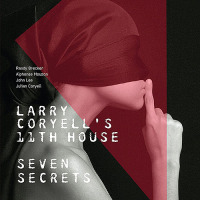 Likewise, Coryell deploys masterful technical wizardry to grab an idea, run with it and share. What makes Duality so much fun is the respect that permeates it; this is no cutting contest. Drew, ever the technician, and Coryell, a true virtuoso, take snippets of ideas, and permutate and volley them back and forth. "The Night Has a Thousand Eyes" puts the duo in a fire-starter, up-tempo environment; both answer the bell, with ideas drawn from their respective, burning technical abilities. 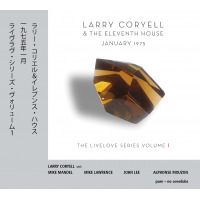 Each player contributes original compositions as well: Coryell with three; and Drew with two. There's occasional subtle humor and note play, too, with Drew quoting a comped "New York, New York" during Charles Mingus "Nostalgia in Times Square." 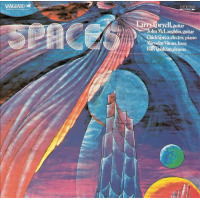 Coryell's "Oil on Water" broods, and Drew's salute to Hank Jones, "Goodbye, Mr. Jones," swings. "Duality: Nenad's Sonata" sends up Coryell's acoustic and amplified guitars running rapid fragments and comping chords in a stellar multi-movement showcase of strum. Bobby Timmons' classic, "Moanin,'" gets a cool, swinging treatment, with both Drew and Coryell displaying marvelous, soulful statements. Duality is a prime example of first class musicianship and sublime improvisational partnership. Duo albumsor that of any sized ensemblesimply don't get more enjoyable than this. 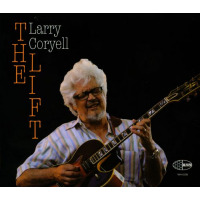 Personnel: Kenny Drew, Jr.: piano; Larry Coryell: guitar.